BRACELET - SARAH COVENTRY. "PARTYTIME" FROM 1974. 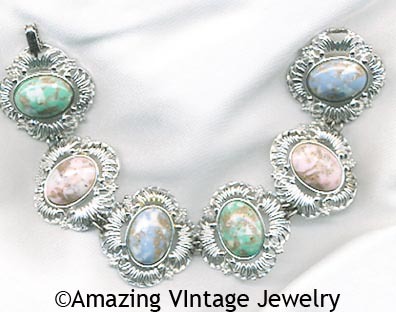 DELICATE, LACY SILVERTONE LINKS COMBINE WITH THE DRAMA OF LARGE MARBLED PASTEL CABOCHONS TO GIVE YOU A FASHIONABLE LOOK THAT IS BOTH BOLD AND FEMININE. VERY PRETTY! 7 5/8" LONG. EXCELLENT CONDITION.